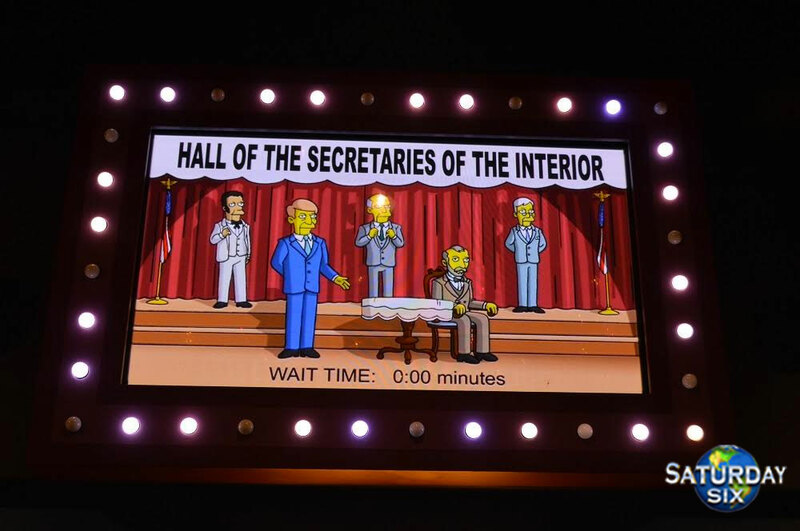 Like the TV show it is based on, The Simpsons Ride pulls no punches in mocking the world of theme parks throughout the attraction. 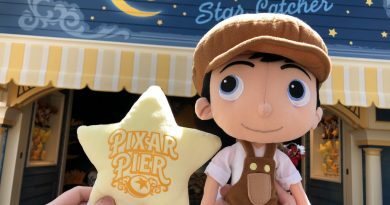 Disney, Universal and SeaWorld take a lot of playful jabs from the attraction’s queue all the way to the gift shop. 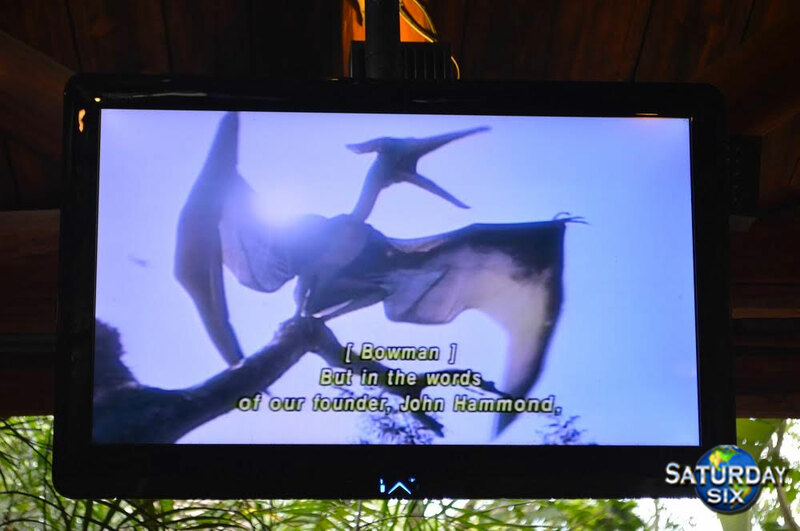 Some of our favorites are seen during the the first pre-show, in which guests watch a video that sets up the storyline of the ride. In between the video, fake ads for attractions at Krustyland (itself a parody of Disneyland) air including ones making fun of The Haunted Mansion, Hall of Presidents, Pirates of the Caribbean, and even Epcot’s defunct Kitchen Kaberet. 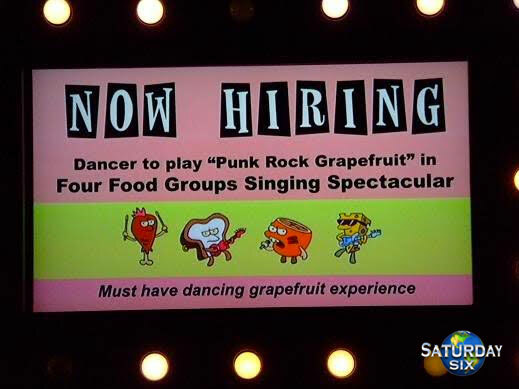 Reference to EPCOT’s beloved Kitchen Kaberet. Shrek 4D takes a lot of criticism from longtime Universal fans, but for people who haven’t done it a million times there is a lot to like about it. 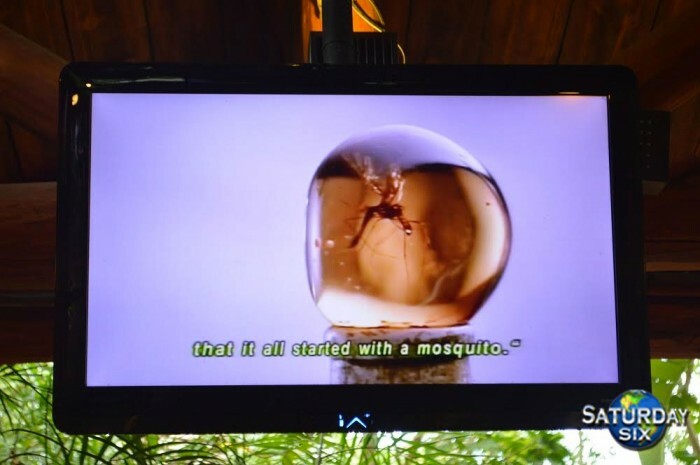 The pre-show is absolutely wonderful. 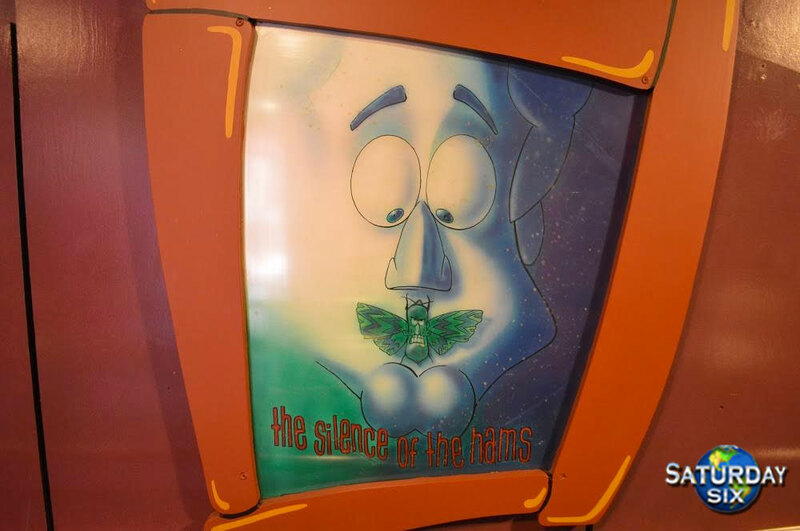 The attraction/film is fun and picks up directly after the first Shrek film ended. We here at the SATURDAY SIX are big fans of sequels that pick up immediately from their predecessor including Karate Kid II, Quantum of Solace, Furious 7, and the Back to the Future franchise. The gift shop also has a lot of fun details along the walls, but we’re going to look at the Shrek 4D queue, which is filled with fake attraction posters that reference Disneyland rides. 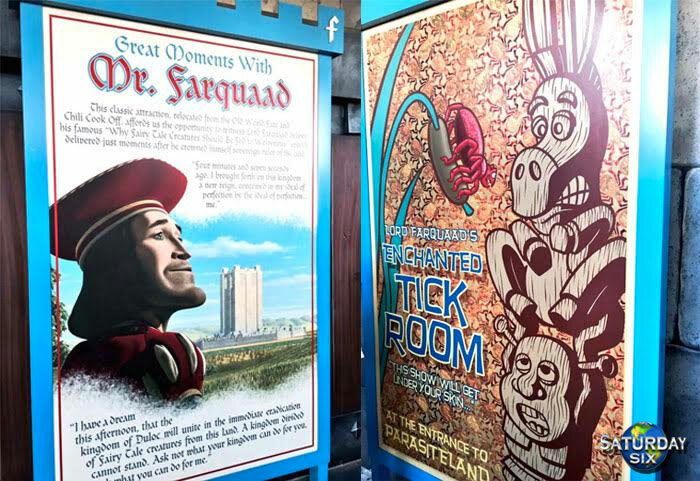 Great Moments with Mr. Farquaad (Great Moments with Mr. Lincoln), Enchanted Tick Room (Enchanted Tiki Room) and Donkbo (Dumbo) are just some of the great posters you’ll see while in line. References to Great Moments with Mr. Lincoln. and the Enchanted Tiki Room. 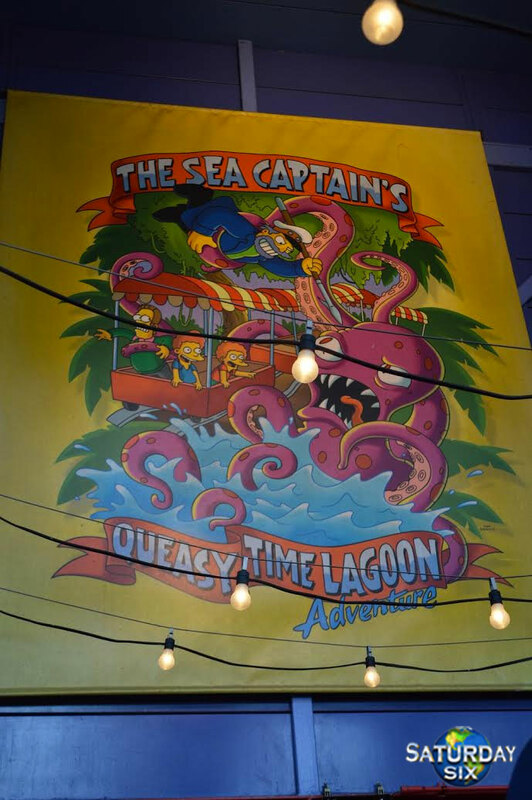 We mentioned The Simpsons Ride pre-show earlier, but before that guests are treated to one of our favorite things inside the Universal parks: gigantic posters for attractions in Krustyland. 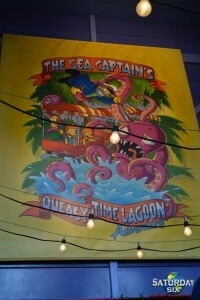 These include Captain Dinosaur’s Pirate Rip-Off (“A ride so old it should be extinct,”) and The Sea Captain’s Queasy Time Lagoon Adventure. These posters are having playful fun at the expense of Disney’s Pirates of the Caribbean and Jungle Cruise attractions. 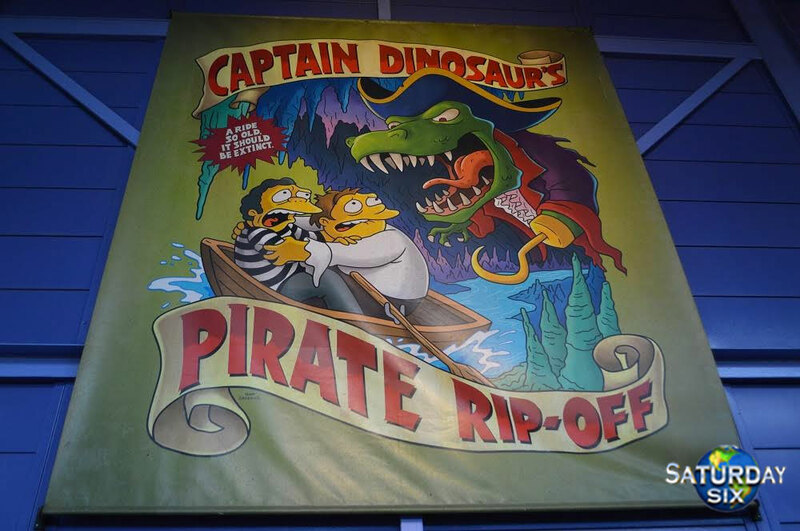 During The Simpsons Ride itself there is an extended sequence making fun of Pirates of the Caribbean including going through a “mist screen” and encountering one of the more famous scenes in the Disney attraction. Later guests go through what is clearly a satire on the It’s a Small World attraction. While in The Simpsons Ride queue, be on the lookout for a huge Krustyland park map that has even more hilarious details including one attraction that bears more than a passing resemblance to Big Thunder Mountain. 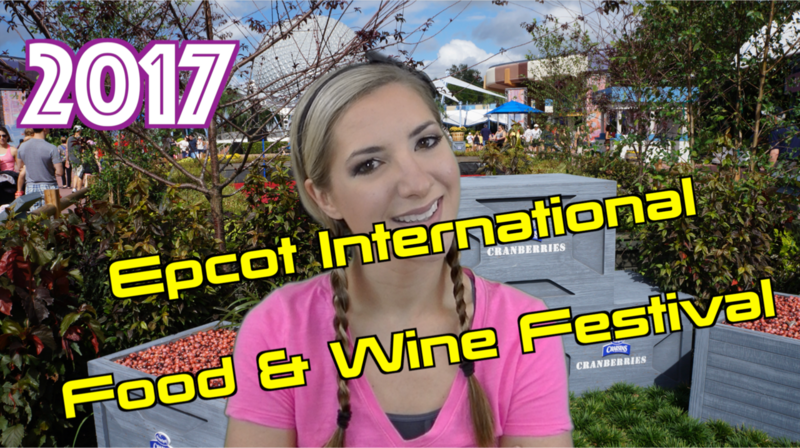 You’ll see that Krustyland has its own “Main Street USA” and even a Skyway! This park map was obviously a labor of love by people who love theme parks, and there’s also a ton of references for fans of the television show as well. A true hidden gem at Universal. Dudley Do-Right’s Ripsaw Falls is one of the most underrated water rides in Orlando, with possibly the coolest looking drops of any attraction. 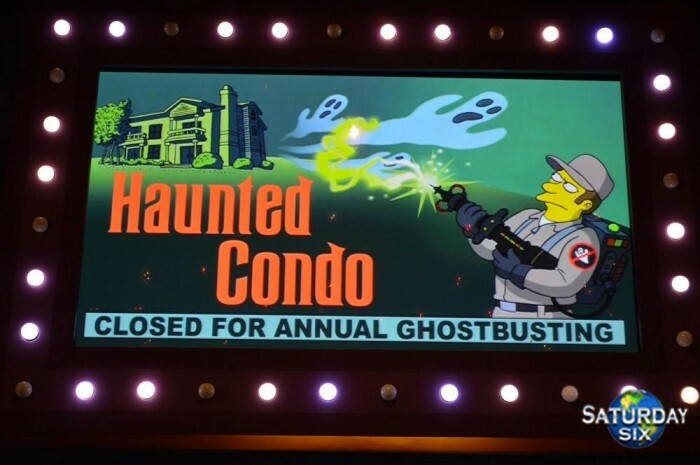 And in classic Jay Ward fashion, it has some great gags in the ride and the queue, some of which poke fun at Disney. 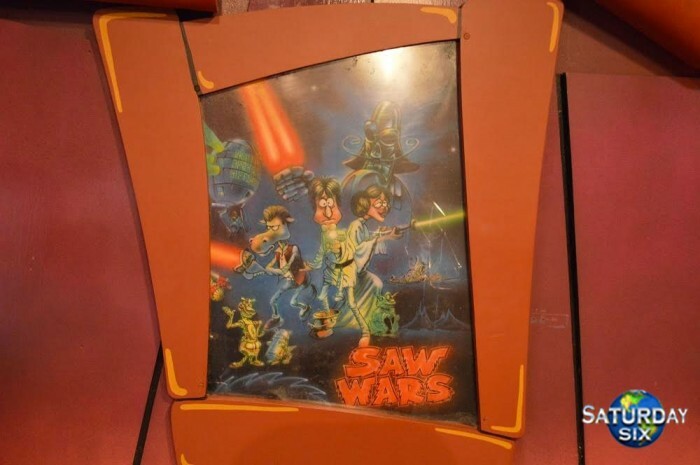 One of the jokes is in the faux movie posters guests see while in the queue. 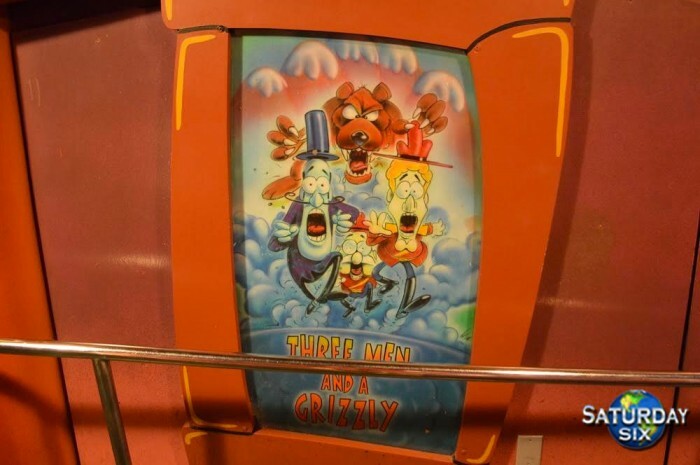 Three Men and a Grizzly is parody of the movie Three Men and a Baby, and while most people don’t think of Three Men and a Baby as a Disney film, it was actually Disney’s first ever live action blockbuster, as well as the first hit of CEO Michael Eisner’s reign. 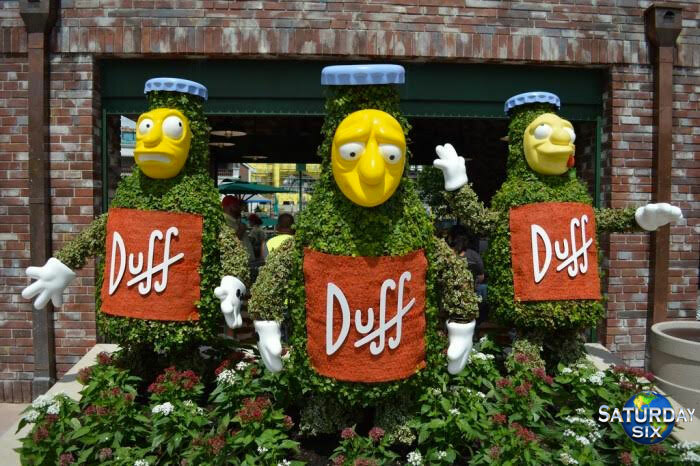 A take-off on Disney’s Seven Dwarfs, the Seven Duffs made their first appearance in the episode Selma’s Choice on Season 4 of The Simpsons. They are pretty much the exact opposites of Disney’s lovable dwarfs. While the dwarfs are short, the Duffs are tall. 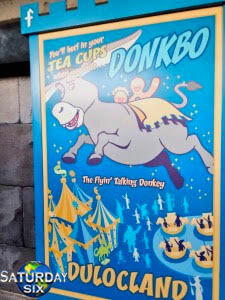 While all of Disney’s dwarfs talk except one (Dopey,) only one of the Seven Duffs talk (Surly.) The names of the Seven Duffs are fantastic: Dizzy, Tipsy, Sleazy, Queasy, Surly, Edgy, and Remorseful. 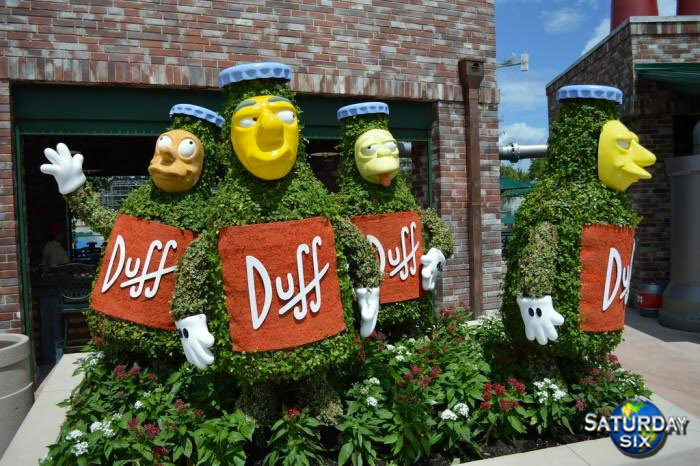 Universal recreated the Seven Duffs as topiaries in front of Duff Brewery in Springfield USA and they are one of the best photo ops in the park. 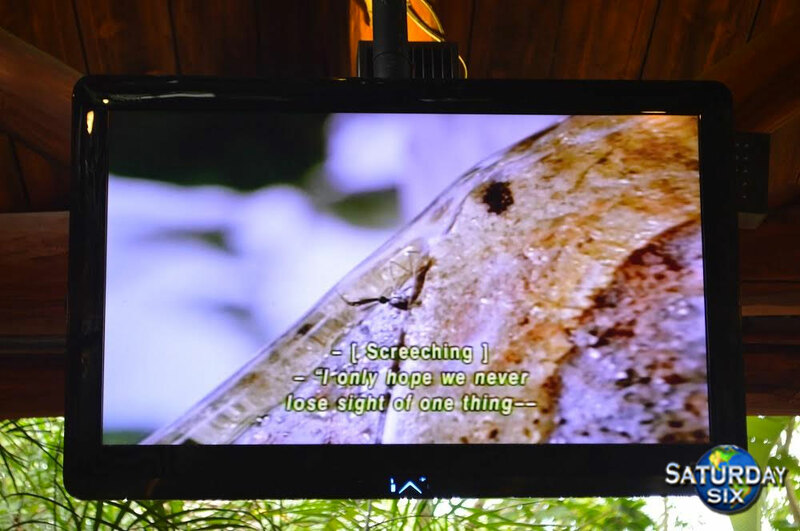 But without a doubt the most famous Walter Elias Disney quote of all is: “I only hope that we don’t lose sight of one thing – that it was all started by a mouse.” Guests in the Jurassic Park River Adventure queue have an opportunity to see Universal have a little fun with this quote during the cheesy video loop playing. 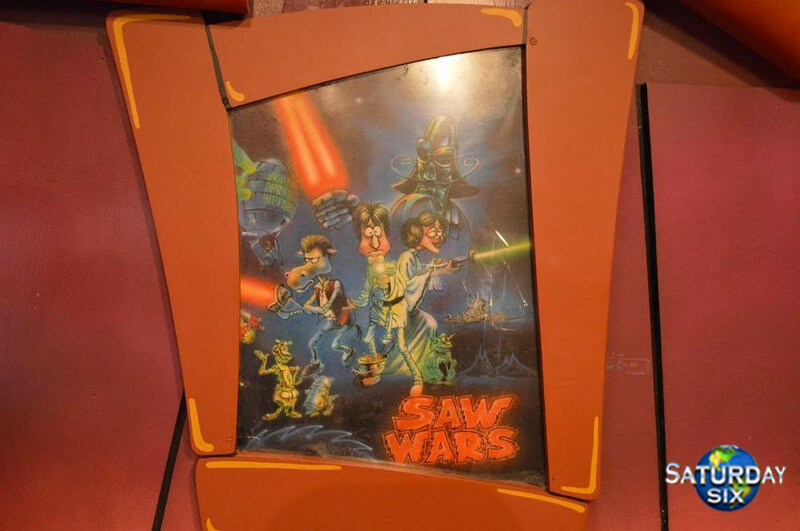 While in Comic Strip Cafe guests may notice the back of a set of lockers used by guests of Dudley Do-Right’s Ripsaw Falls. In these lockers are references to a lot of Universal things such as The Cat in the Hat, the Blue Man Group, and Woody Woodpecker, but one reference looks to be of a certain Disney film staring fish. 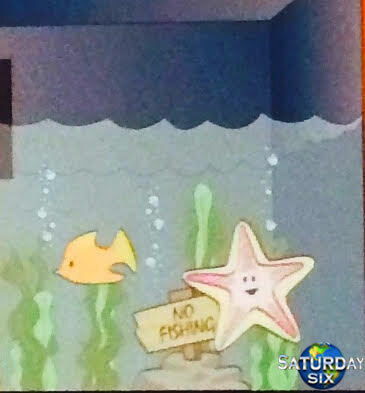 That’s right, one locker looks to have what could pass as Nemo and Peach the starfish from Finding Nemo. 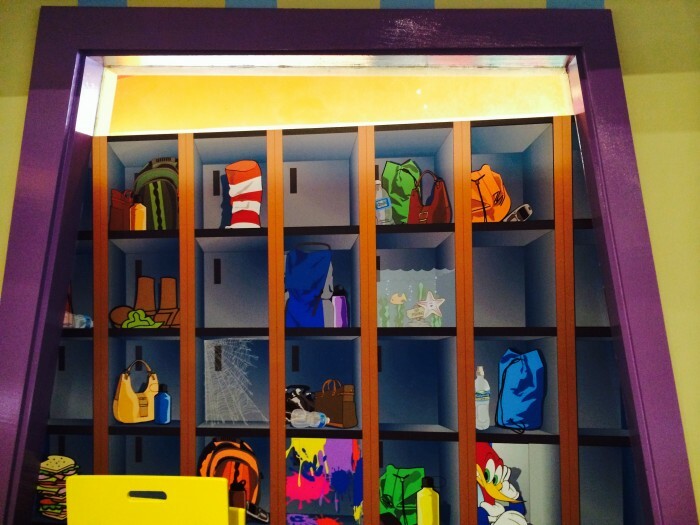 Backside of Toon Lagoon lockers as seen from inside Comic Strip Cafe. Special Thanks to crack staff photographer Brandon Glover, Logomeister @DrewOfOU, The Iron Stomach @AmusementBuzz, and blogger to the stars Megan Stump for their invaluable assistance with this article. Be sure to also check out Brandon on The Park Blogger podcast with co-hosts Aengus Mackenzie and Brian Carey. That one is actually already gone unfortunately as Jimmy Fallon is on his way to USF, but you can see the Mickey Ears in THIS ARTICLE looking at the “Easter Eggs” at Universal. I’ve never been to Universal, but every time you devote a column to that park I tell myself I need to give it at least a few days next time I’m in town. If you can walk into Diagon Alley and think you still haven’t spent your money wisely, the SATURDAY SIX will gladly refund you in hugs.